This recipe was adapted from Cooks Illustrated Cookbook with only minor changes made to the original recipe. In these colder than cold Arctic days we've been having as of late, the only thing that really warms me up is a hearty bowl of hot soup! Today I decided to make Mr. Rosemary Lane's absolute favorite potage, New England clam chowder! 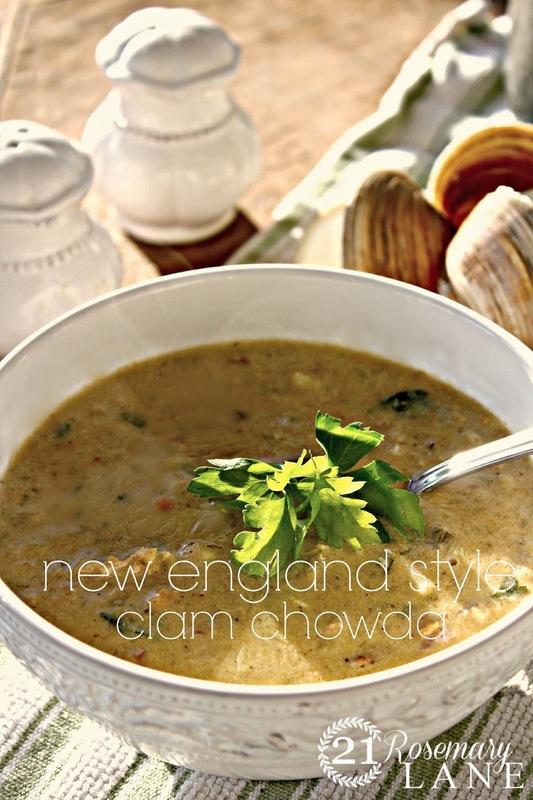 This chowder is made with freshly steamed Middle Neck clams, celery, onion, fresh thyme and a smokey bacon, so the base is really packed with flavor! The Yukon Gold potatoes have a moderate level of starch which is released into the mixture during the cooking time. This helps to nicely thicken the chowder. Oh and make sure you pick up a bag or box of oyster crackers to toss in with your piping hot chowda!!! 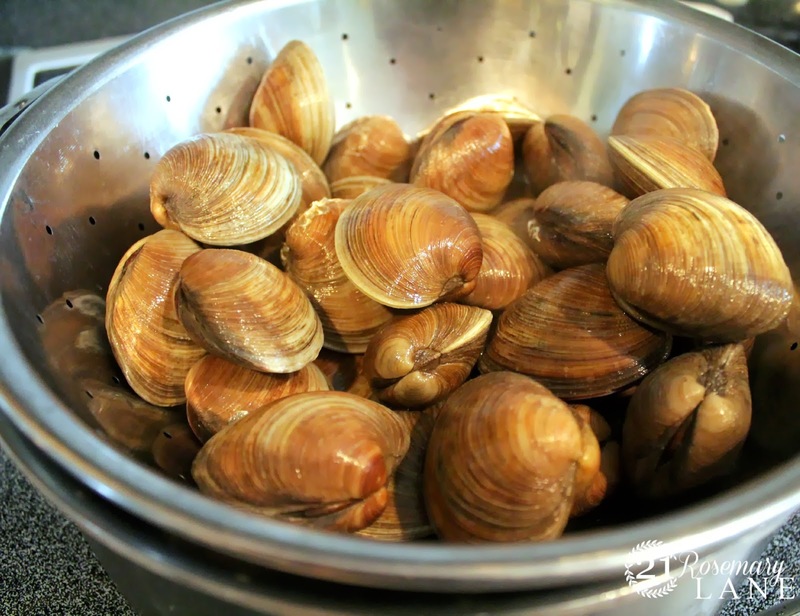 To start heat 3 cups of water in a large pot or Dutch oven, then in a metal basket or strainer steam the scrubbed clams until they are all opened up. Discard any unopened clams, keep the reserved juices and set it aside. Next, in the same pot, heat bacon for about 6 minutes. Then add celery and onions and let them cook until soft, about 4-5 minutes. Add a little of the reserved juice from the clams if needed, then add 3 tablespoons of butter and let it melt. Add 3 tablespoons of flour and make a roux. Slowly add the reserved clam juice along with the bottle juice and one bay leaf. Let the mixture thicken and then add 1 lb of Yukon Gold potatoes and bring to a boil. Reduce heat and let simmer for about 20-25 minutes. Once clams are cooled remove them from their shells with a sharp knife and mince. At the end of the 20-25 minute cooking time the potatoes should be soft but still have their shape. (The beauty of Yukon Gold potatoes.) Let the mixture cool somewhat and remove the bay leaf. In a blender add the mixture in small batches and blend till smooth. I like my chowder to have some chunkiness so I don't blend all of the mixture. Return the soup back to the pot and heat through. Turn off the heat and pour in 1 cup of heavy cream, or you can cut the cream with a 1/2 cup of milk or Half-n-Half. Then add the parsley and the clams. Let the mixture warm the clams through for a couple minutes and then serve. 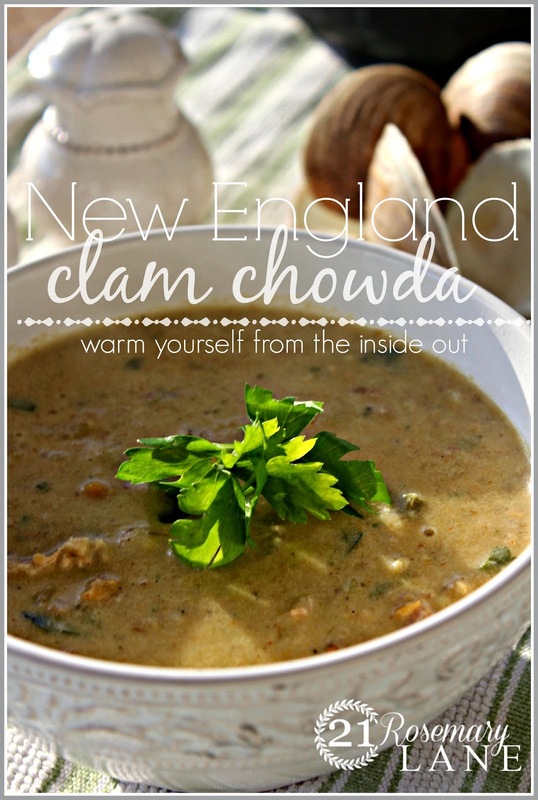 The chowder looks amazing and making me sooo hungry. I must admit I've never made clam chowder using fresh clams. I think I've missed a real treat. Visiting from Ivy and Elephants. Beautiful recipe Barbara and lovely blog you have here. Found you at Ivy & Elephants and so glad I did! Pinning and following. Have a great day.